Did you know a honey bee will produce only one drop of honey in its lifetime? Or that the Monarch Butterfly makes one of the longest migrations of any species? Or that an Atlas Moth neither eats nor drinks ever again after its transformation from a caterpillar? You can learn and experience all these things and more at a new exhibit just off the 101 and Via De Ventura in Scottsdale. 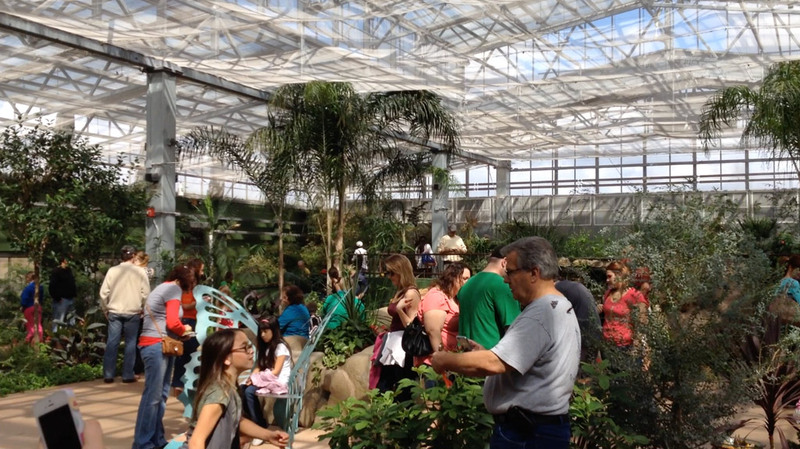 In May of 2013 the Butterfly Wonderland opened its doors, giving new dimension to the local desert landscape. The facility offers visitors an incredible experience of stepping into a world teaming with life and beauty. The first part in the experience is a 15 minute, 3D movie that tells the dramatic story of the Monarch Butterfly, and its migration that begins in Canada, and ends in Mexico. This very captivating movie follows the journey of three generations of Monarchs as they travel from Texas, to Canada, and back down south to Mexico, where they gather for the winter in the shelter of huge pine trees of the arid forest, land that is now protected by the World Heritage Forest Program. Even the littlest of guests will be fascinated by the butterflies swirling overhead during the movie, looking so real, someone in the audience is always lifting out their hands to try and touch them. The second stop is the emergence gallery, where guests can view butterflies in various stages of chrysalis development. At first this exhibit looks almost artificial, but looking closer you realize that some of those little pods are wiggling! Watch long enough and you may even see a butterfly emerge. Step through the next door, and you will finally be introduced to the main atrium. Truly a living gallery, this butterfly atrium is teaming with life. Hundreds of butterflies flutter through the air, often landing on you as you walk around. Keep your camera handy, because you may suddenly find that you have a gentle passenger on your shoulder or head, hitching a ride. One of the main rules for the atrium is do not try to touch or pick up the butterflies. They are very delicate, and could be hurt easily. If they land on you, that is a special treat, and no problem at all. Just don’t pick them up. If you need help, or one of your little ones is uncomfortable with a butterfly on their shoulder, just ask one of the butterfly experts for help. There are always several people in the atrium ready to answer questions or point out interesting things. Also inside the atrium is a small pond, filled with bright orange fish, always a favorite for kids. 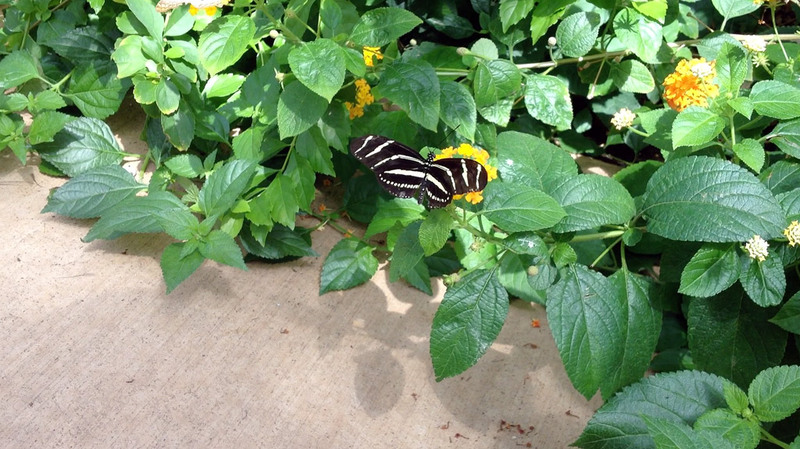 Another thing to keep in mind is that inside the main atrium is very hot and humid, because the butterflies flourish in the warm temperatures. 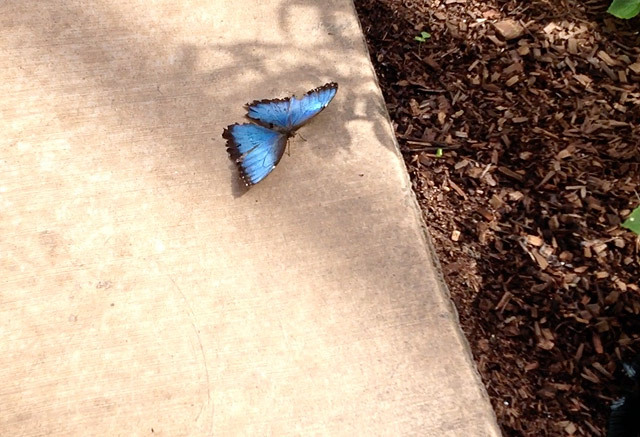 You will often see them sitting in the middle of a pathway with their wings spread out, soaking up the desert sun. Watch your step! While strollers are welcome throughout the building, they are not allowed inside the main atrium anymore, because too many butterflies were using them to hitch hike to other parts of the building. There is stroller parking in the emergence gallery, right before entering the atrium. For parents of little ones, it may be hand to have a baby carrier ready for this part of the tour. When you exit the main atrium, you enter the butterfly café. Bring your own lunch, or enjoy a meal for purchase. They offer a selection of decent sandwiches, and always some peanut butter and jelly for the kiddos. Sodas, cookies and crackers can make a perfect pit stop if you just need a quick break. A working ant farm, a colony of honey bees, and a family of scorpions are the next exhibit. In this room you can find a scorpion with a small UV light, watch the ants create tunnels throughout their farm, and try to find the queen bee in her hive. The bee hive has a tunnel that exits to the wall outside, where the bees are free to fly off and pollinate local flowers. The last room is the Rivers of the Amazon, where you can touch Motoro stingrays in a central tank, and see many types of exotic fish as they swim in their tanks around the sides of the room. Paper towels and sinks are provided, so don’t be afraid of getting your hands wet. Hours of operation are 9 a.m. to 5 p.m. Adult ticket prices are $18.95, and children ages 3 to 11 are $9.95. 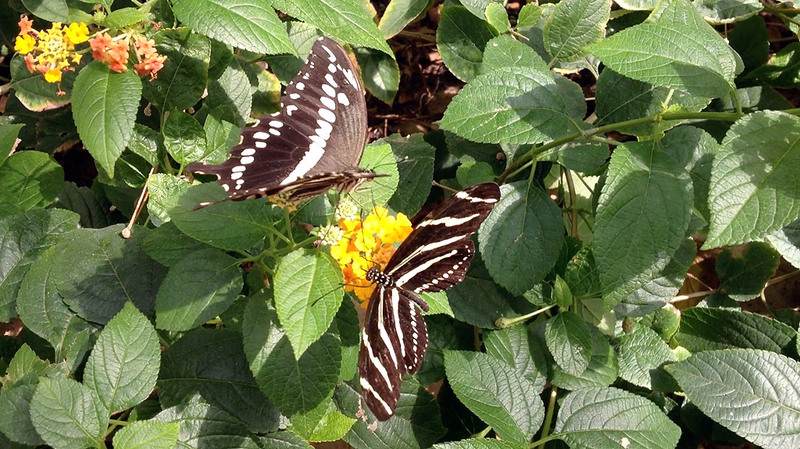 Butterfly Wonderland also offers a military, senior, and student discount of $16.95. You can also buy yearly memberships for individuals or families that include a 10% discount in the gift shop, and special pricing on parties or events. Leave yourself about two hours for this adventure, but remember, if you get too warm inside the main atrium, you can always go enjoy other exhibits, then head back in whenever you’re ready. Your ticket is good for the entire day. 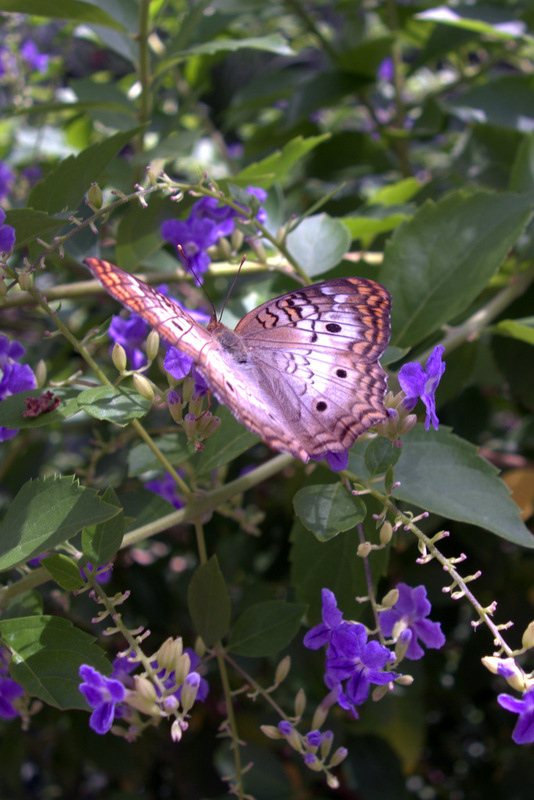 If you have the time, you will find little more pleasant and beautiful than sitting and watching the butterflies. 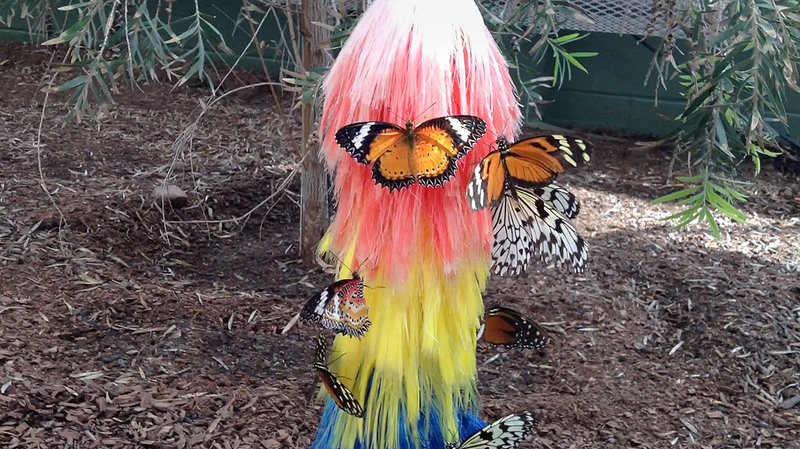 Butterfly Wonderland is located in Scottsdale just off the 101 freeway on Via de Ventura.